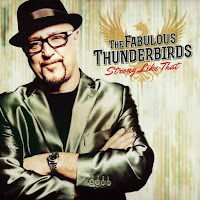 JP's Music Blog: CD Review: The Fabulous Thunderbirds Return "Strong" & Sugary Ray & The Bluestones Are Worth "Believing"
CD Review: The Fabulous Thunderbirds Return "Strong" & Sugary Ray & The Bluestones Are Worth "Believing"
American blues/rock band The Fabulous Thunderbirds have been around for over 40 years. Their first couple albums featured the guitar work of Jimmie Vaughan (brother of the late Stevie Ray Vaughan) and Keith Ferguson on bass to support lead singer/harmonica player Kim Wilson. They mixed together southern Texas-rock with rhythm and blues to create a unique sound that broke-through the airwaves in 1986 with their top 10 single, "Tuff Enuff." Since their beginnings, The Fabulous Thunderbirds have gone through a number of line-up changes with the one consistent factor being lead singer Kim Wilson. His latest line-up of the band recently released their 14th studio album titled "Strong Like That." The new album features ten tracks that keep their blues infused soul music alive and sounding great. Beginning with "(I Know) I'm Losing You," Wilson trades solos with guitarist Johnny Moeller on the song's boogie shuffle rhythm. The band digs deeper into the blues with classic soul appeal of "Don't Burn Me" as Kim Wilson lets his vocals soar. Some southern, New Orleans flair leaks into the keyboard/horn infused sound of "Drowning On Dry Land" and "Smooth" carries a nostalgic feel of the R&B groups of the sixties. The album wraps up with the thick blues swing of "Meet Me On The Corner" and the title song "Strong Like That," which finds the perfect groove that has keep The Fabulous Thunderbirds one of the longest running bands in the music business. The Fabulous Thunderbirds have a couple shows lined-up at the moment and to find out more about their newly released album "Strong Like That," please visit fabulousthunderbirds.com. Blues singer Sugar Ray Norcia began playing harmonica while still in high school. Shorty thereafter he formed his group called The Bluetones, which have played alongside such blues greats as Big Mama Thornton and Big Joe Turner. They released their first album in 1979 and continue on to this day with their seventh studio album through Severn Records titled "Seeing Is Believing." The new twelve song release start off with the Mississippi blues original "Sweet Baby" as Sugar Ray introduces the magic of his band The Bluetones. They turn the title song "Seeing Is Believing" into a modern blues gem about losing a love. They pick the tempo up for the guitar-romp of "Noontime Bell" as a timeless quality rings through all of the songs on the new release. They deliver an electrifying blues-rock swing with "Blind Date," then cover B.B. King's "You Know I Love You" featuring the great guitar work of Monster Mike Welch as a tribute to the late blues legend. The album finishes with the six-minute jolt of "It Ain't Funny," the sweet, slow blues of "Not Me" and the harmonica driven powerful album closer "It's Been A Long Time." 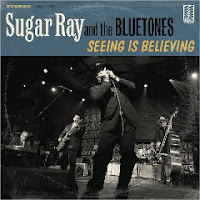 Sugar Ray And The Bluetones have about ten live shows lined-up through the end of the year. For a complete list of shows and to find out more about their new album "Seeing Is Believing," please visit sugarrayandthebluetones.com.